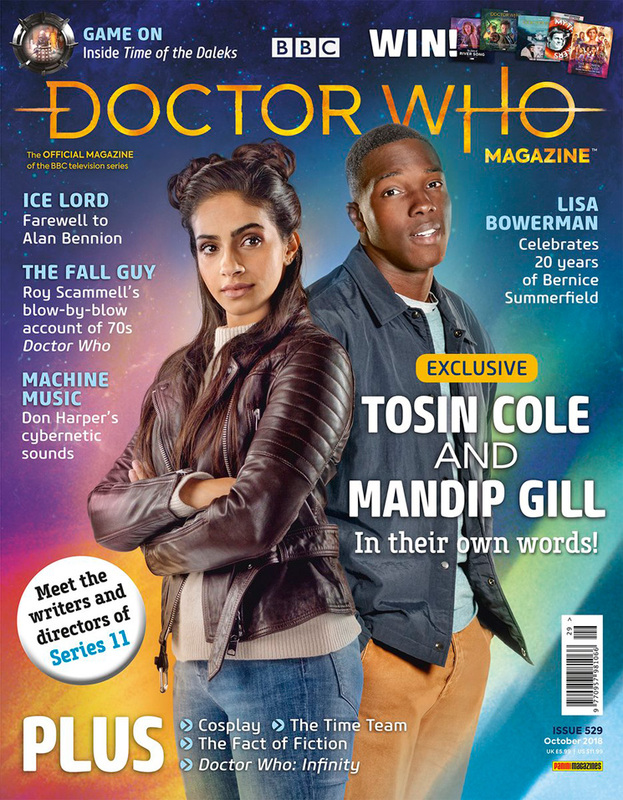 MANDIP GILL AND TOSIN COLE WRITE FOR DOCTOR WHO MAGAZINE! Mandip and Tosin, who play companions Yasmin and Ryan in Series 11, share their Doctor Who diary in a DWM exclusive. A massive double-sided poster featuring the Thirteenth Doctor, Graham, Ryan and Yasmin. Interviews with the writers and directors of Series 11, with an introduction from showrunner Chris Chibnall. The film and TV stuntman discusses his unforgettable contributions to the series in the 1970s. The life and career of the composer whose score for The Invasion is about to be released. The actress who has played Bernice Summerfield for 20 years answers questions from the TARDIS tin. A tribute to the actor who played three Ice Warriors in 1960s and 70s Doctor Who. Inside Gale Force 9, the company behind the latest Doctor Who board game. Part Six of this comic strip adventure featuring the Doctor and Bill. The reviewers watch three pseudo-historical stories: The Time Warrior, The Talons of Weng-Chiang and Thin Ice. In-depth analysis of the 2013 Eleventh Doctor story Hide. Australian comedian Rob Lloyd explains how he creates his Third Doctor look on a budget. The Blogs of Doom, previews, reviews, news, prize-winning competitions and much, much more! Doctor Who Magazine 529 is on sale now, price £5.99. Cancelled my subscription so can somebody let me know if this issue has the last part to the final 12th Dr Comic?? Wait can somebody please confirm if this is the last or they’re doing a part 7 or 8??? The final panel says “next: the last stand” and next issue is previewing the first episodes of series 11 (meaning that presumably in two issues’ time the new series has started) so I imagine next issue is likely to be the last part in order that once Jodie’s Doctor is on air she’s in the comics, but I couldn’t be certain. Does this come out in the US on Thursday as well, or will it be a little bit later over here? Will there be a page for the Season 19 Blu-ray set now it’s been announced? I wrote the Roy Scammell interview… Probably my last DWM contribution after previous interviews with Jon Pertwee, Richard Franklin, Bob Baker, John Levene, John Leeson, Eric Roberts, Derrick Sherwin, Terrance Dicks and Jessica Martin… One helluva ride! When is this gonna be in shops? Totally on the ball! I got mine today! Me too! It’s certainly the best issue in a while. Is there still an article about Comic-Con in it? Like it said in the blurb in the previous issue for this issue,some kinda exclusive look from Comic-Con or summat. Excuse me if I expose nyself as a bad fan, but what exactly is time of the daleks? Is it a audio or a comic or something. There is an audio story called “The Time of the Daleks”, but I believe this is talking about the board game, Time of the Daleks. Me too! 2 days earlier than normal! I’m sure the figurine collection will be pleased to learn their magazine isn’t official. is that what DMW have said? Does say only just official. Tbf, does anyone buy the DWFC for the magazines. Personally, I consider the magazine a free gift. Its a official figurine collection not a official magazine as the magazine is just one element of the figurine collection. There’s a leaked image of one of the pages doing the rounds with the announcement on it. Announced in DWM’s Gallifrey Guardian. Will be released on the 19th November 2018. 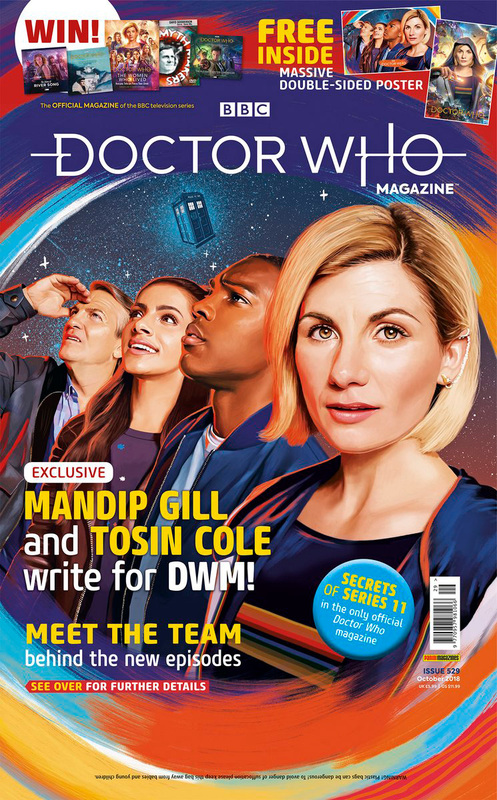 I don’t usually get DWM, but I may get this one as there’s new info on series 11. And I would like that poster.